This is my first reporting from Directions EMEA this year. I’ve arrived in Mannheim two days earlier because of my other obligations and I registered yesterday after rain stopped, but this is actually first day of Directions EMEA 2015. Keynote is finished and from this moment, Microsoft Dynamics NAV 2016 is generally available. Group of Microsoft Dynamics Program Managers with Marko Perisic as leader, made an awesome job on scene. They presented the most important news in new NAV release very effective. 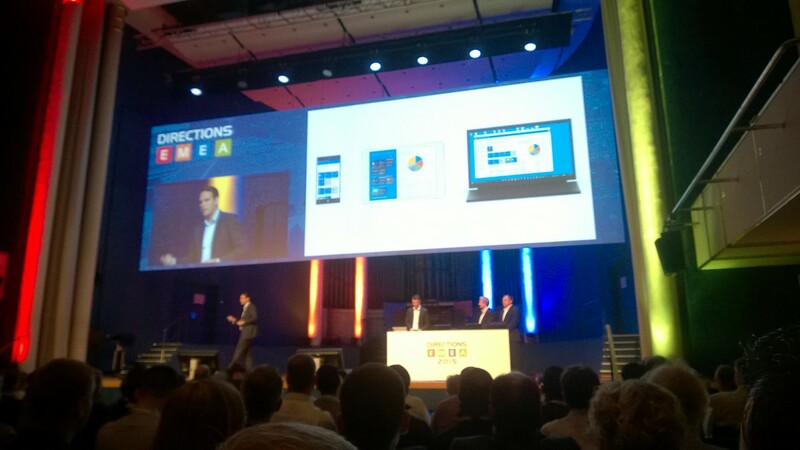 Of course, guys from Continia also made amazing show in second part of Keynote with their new solution. Now, other sessions are starting and we can see lot of news and interesting things. On Keynote scene we could see NAV Mobile App, a lot of new Web Client features, e-service exchange in practice, natively CRM Online integration, natively NAV reporting in Power BI,… I don’t want to write about all news now. I will write about them, one by one in few following posts. Now, I only want to say that you can download new NAV now from this Partner Source link and let’s driving start. Now nothing else about NAV 2016 is not by NDA. is there any solutions for error that after installation of Microsoft Dynamics NAV 2016 on W10 PC I can’t access to Microsoft Dynamics NAV 2015 Administration Tool? I tried famous method of registry changing for 2 keys but there’s no success. Then I found that when I installed NAV 2015 I had one set of registry, but when I install after NAV 2015, NAV 2016 this set of registry is just modified for NAV 2016 (9.0). Is this some kind of bug because installation does not insert registry keys, just modify existing registry keys (from NAV 2015)? I downloaded NAV 2016 from partnersource. Is possible to connect an on premise nav 2016 database to the NAV content package in Power BI?